Had Jason Isbell stopped making music after his run with the Drive-By Truckers, his output would have already been legendary enough. “Outfit,” and “Goddamn Lonely Love,” alone are inches away from being modern standards. After a few promising records in the midst of a drugs-and-booze phase, Isbell got clean and released Southeastern in 2013, a stunning record of recovery and personal and professional redemption, followed soon after by 2015’s Something More Than Free. Despite releasing these albums under his own name, his backing band The 400 Unit performed with him on those records. 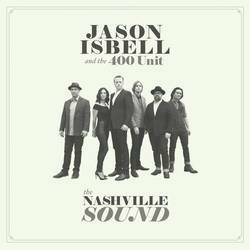 Now on his latest, The Nashville Sound, their top billing returns, as they take more of a central role on Isbell’s songs. What’s immediate from the album is a sense of looseness in Isbell’s songwriting and the band’s playing that hasn’t really felt a part of their sound since 2011’s Here We Rest. Whereas songs on Southeastern and it’s follow up sounded great, they had a sort of insularity absent on their earlier albums. Album opener “Last of My Kind” fades in, as if you’re getting a glimpse of a group of people playing together in a room, as Isbell sings about being left behind by the changing world. The song picks up with subtle intensity with every verse. This naturalistic style of production is a hallmark of longtime producer Dave Cobb’s style – here, it reintroduces the The 400 Unit as, well, a unit. “Cumberland Gap,” is next, and it’s probably the most galvanic rocker that Isbell has written in some time. It has the propulsion of a later Springsteen and the E Street Band track, full of hardscrabble guitars and a soaring chorus. That’s not just only in the band’s sound. Isbell borrows from Springsteen’s populism, as Isbell sings about the working class, in this case, the families of miners. Then there’s “If We Were Vampires,” an arresting duet between Isbell and his wife, Amanda Shires. The song sounds gothic on title alone, it’s anything but. Essentially, it’s an acoustic ballad where Isbell and Shires ruminate on the limited time they have together while they’re alive. “It’s knowing that this can’t go on forever/Likely one of us will have to spend some days alone/Maybe we’ll get forty years together/But one day I’ll be gone/Or one day you’ll be gone.” It’s spare, beautiful and nothing short of a classic. The sweet irony of the song is unlike the two that sing it, it will live forever. “Anxiety” is a seven-minute epic about just what the title suggests. The guitars are stormy and the rhythms insistent. Isbell’s lyrics may be familiar to those who struggle with it: “You got to give me a minute/Because I’m way down in it/And I can’t breathe so I can’t speak/I want to be strong and steady, always ready/Now, I feel so small, I feel so weak”. They eventually give away to a furiously strummed bridge which kicks into a wily guitar solo. The lyrics, although familiar, may be a tough sell and with many artists shouldn’t have worked, but Isbell’s earnestness and the mastery of The 400 Unit sell it. The last two songs on The Nashville Sound are songs of great reflection – “Hope The High Road,” and “Something to Love”. On the upbeat “Hope The High Road,” Isbell takes stock of everything he’s learned over the years, through sobriety, marriage and fatherhood. “I know you’re tired/And you ain’t sleeping well/Uninspired/And likely mad as hell/But wherever you are/I hope the high road leads you home again.” It feels like a salve for the wounds inflicted on the world of the past few years, what feels an endless string of bad news. “Something to Love,” is very much a song where Isbell sings to his young daughter. Paired with Shires on background vocals, the parents sing about hoping she finds ‘something to love, something to do when you feel like giving up’. It’s a sweet and easy ballad, but it feels like the song order should be reversed. Maybe. “Hope the High Road” feels like a pep talk to everyone. “I’ve sang enough about myself,” he sings. Ok, fine. Makes sense. “Something to Love” is the denouement and a look into the future. On The Nashville Sound, it’s clear his focus has shifted. It’s less about him, and more about his family. It’s remarkable watching Jason Isbell grow as both a person and a musician. Through his daughter, more stories are to be told. Perhaps as a result, Isbell’s next act will be even better than the first two. Posted July 4, 2017, 10:01 a.m.